A community group on the Lower East Side is hoping to keep thousands of partiers dressed as Kriss Kringle from swooping in this weekend. The Lower East Side Dwellers are putting up posters around the Manhattan neighborhood asking bars not to serve participants in the annual SantaCon bar crawl on Saturday. "The purpose of the sign is to call attention to the issues that come up from the drinking, the puking, the vomit that we have in the streets in our neighborhoods that we have to clean up the next morning," said David Troutman, of the organization. 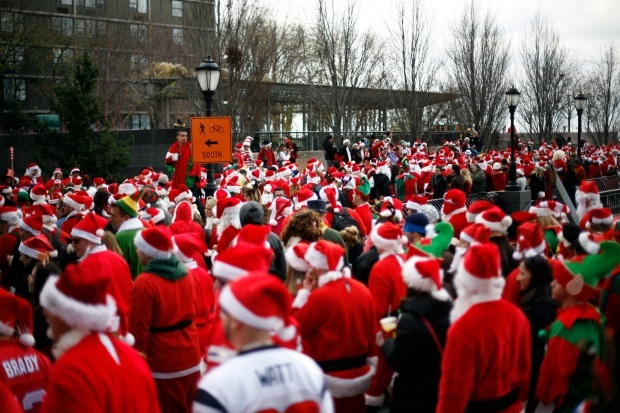 SantaCon, which this year starts at 10 a.m. in Tompkins Square Park, raises money for several local charities, according to the event's website. Merrymakers are given the crawl's route throughout the day via social media; this year, it will snake through the East Village, Lower East Side and parts of Brooklyn. The event's website warns participants to behave themselves. "Santa's been getting a lot of slack for the way we’ve been to this fine city," the website says. "So this year we are cleaning up Santa’s act." Still, Lower East Side residents and bar owners both say that last year's event got a little too festive. "You see the red suits and you're like, oh God," said Will Cibian, a general manager with Libations. Cibian said Libations won't serve anyone in a Santa suit after about 5 p.m., and Dan Balkin at Spitzer's Corner said the bar won't be letting in SantaCon participants at all. "We are turning Santas away at the door because it's just sloppy," Balkin said. "Sloppy Santa." The Long Island Railroad and NJ Transit are also doing their part to keep SantaCon participants from getting too jolly. Both rail systems have banned alcohol on trains Saturday.